The forecasts for global real estate markets for 2012 may be gloomy, but over the past 5 years, prices have registered huge gains in the top real estate markets of the world. Naturally, this sparks fears of an asset bubble and raises concerns over an increasing household debt. 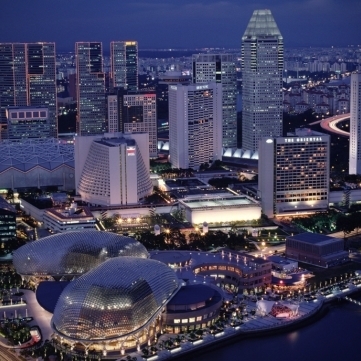 It is useful for you to know how Singapore ranks by way of affordability if you are intending to move to Singapore, be it as an employee or an investor. Thus, we present to you a list of the world’s 10 hottest property markets (by way of percentage point increase in indicative prices from 2006 – 2011) in ascending order, with the national 5-year averages reflecting the mainstream housing prices in most major cities of these listed countries except for China (only Beijing and Shanghai) below. Switzerland is home to some of the world’s most expensive cities, and it is not surprising that it has seen property prices boom in the past five years. With low interest rates aimed at countering the franc and at slowing growth sparking this surge in prices, the highest level of home prices in nearly 20 years was recorded in Q4 2011, prompting the Swiss National Bank to try and stem what is deemed as excessive mortgage lending. Swiss cities St. Moritz, Gstaad and Geneva were among the 10 most-expensive places, measured by square-meter costs. For instance, in Geneva, the average square-meter price of a prime property was US$31,900 in the fourth quarter of 2011. Despite measures by the Malaysian government to try and curb rising property prices in Malaysia, the prices have still increased significantly. Prime property in capital Kuala Lumpur costs about US$5,000 per square metre in 2011. Due to pressure from middle-class Malaysians who are priced out of the real estate market by wealthier overseas buyers, however, the government is considering raising the minimum price of homes that foreigners can purchase from US$162,972 to US$325,944 and to consider doubling the entry price for foreigners buying property in the country. Malaysia’s economic growth of over 5% in 2011 has also whetted buyers’ appetites for high-end condominiums that, while smaller, command a higher price per square footage because of the facilities and the prestige attached to them. Of all the European countries, Switzerland and Norway are the only European countries that are among the world’s hottest housing markets amidst Europe’s gloomy economic outlook. Norway, oil-rich and whose economy is set to grow 2.7% in 2012, has low interest rates facilitating the purchasing of property by citizens and contributing to the jump by 6.8% year on year in March despite figures indicating that housing prices have been growing almost twice as fast as wages this year. Like Switzerland, Norwegians buying property also get a 28% tax deduction on interest payments, which causes stress upon property prices. Unlike the U.S. whose housing market has still yet to recover from the 2008 global financial crisis and its massive debt, Canada’s housing market has stayed robust over the past few years due to a surge in existing home sales and in apartment construction. Ontario, the country’s most populous province, has seen heavy investment in condominiums and numerous new urban developments increase by more than 50% in March. Vancouver, its most expensive property market, is mostly popular with foreign buyers as it is often ranked among the world’s best places to live. Accordingly, it saw prime property prices jump 10.4% in the third quarter of 2011 from the period last year. The average price for a residential property in Vancouver was US$734,207 in December, compared with the national average of US$358,261, according to the Canadian Real Estate Association. Rapid urbanization has led to crowded housing conditions in one of the world’s most densely populated countries, where housing prices rose more than 30% on average between 2006 and 2011. Recently, measures introduced by the government like the “luxury tax” and a 10% tax levied on any investment property sold within two years (or 15% if the property is sold within 1 year) have been slightly effective in driving down prices but Taiwan remains among the top 10 expensive places in the world to buy property. Colombia, the only South American country on this list, attributes its increase in house buying especially among the growing middle-class as well as the surge in prices to its rapid economic expansion, with GDP growing nearly 6% in 2011. A relatively successful decade-long military offensive against illegal armed groups and drug cartels has also made it safer to do business in the country, thereby attracting foreign investment in droves (more than 30% in Q1 2012 to US$4.2 billion) and in turn boosting property prices. Foreign direct investment jumped compared to the period last year. The most expensive real estate market in Southeast Asia and the third-most expensive city in Asia to rent high-end property, the average price of prime property in the little country was US$25,600 per square meter or US$2,600 per square foot in Q4 2011. This is not surprising, seeing as how Singapore is a regional financial hub with world-class quality of life, public amenities and the penchant for ostentatious status-reflective property developments that offer a lifestyle representative of the ‘Singapore Dream’. Additionally, low interest rates and the massive immigration of people from all over the world in recent years have boosted demand for homes where space is a precious scarcity— foreigners make up almost half of Singapore’s almost 5.3 million residents and accounted for 18% of new homes sold in Q3 2011. For example, among these foreigners, PRC Chinese are the largest buyers accounting for 30.6% of foreign sales in Q3 2011. Nevertheless, public discontent over such skyrocketing property prices has led the government to implement measures to cool the market. In December, the government hit foreign property buyers with an additional stamp duty equal to 10% of the property value. This has contributed to property prices marking their first quarterly fall in nearly three years of 0.1% in January to March this year. Having been the third-hottest housing market in the world since 2009, high property prices in Israel led to a series of protests in July 2011 with demonstrators demanding the government to intervene to cool the market. However, interest rate cuts have led to a resurgence in property demand, new mortgages issued by banks and an overall increase in price. As a major global financial centre, Hong Kong overtook London last year as the world’s most expensive office rental market and the average price of a home in prime areas was about US$47,500 per square metre or US$4,400 per square feet. The growing wealth of mainland Chinese people, coupled with mainland China’s property restrictions, has led to an influx of wealthy mainland Chinese buyers in Hong Kong’s residential market in recent years, with as much as 30% of buyers for luxury property being mainland Chinese buyers. As such, in an effort to cool the market, the Hong Kong Monetary Authority introduced a measure recently requiring buyers whose principal incomes are not in Hong Kong to pay an extra 10% in down payment when buying a house in Hong Kong. Nevertheless, it remains the second-most expensive place in the world for property. Housing prices in major cities Beijing and Shanghai have surged by over 110% in the past 5 years as the world’s second biggest economy experiences rapid growth of its economy. A home in Shanghai’s prime areas costs US$19,400 per square metre or US$1,800 per square foot, from a survey at the end of 2011. In Beijing, the same type of property in a prime area costs an average of US$17,400 per square meter or US$1,600 per square foot. Fears of a property bubble have led the Chinese government to limiting multiple home purchases in the last 2 years, raising interest rates and hiking bank reserve requirements. However, despite these cooling measures, the country’s home prices are still far from a reasonable level, and the country’s property developers, have enjoyed rising sales and an increase in their market value this year. Therefore, when moving to Singapore, it may be observed that there are many factors that you will have to take into consideration, not only in matters of pricing but also in tax issues. Do consult our Singapore tax professionals today for a clear assessment of your options.